A thing of beauty is a joy forever. Be joyous forever by using Aloe Veda beauty products. Yes, Aloe Veda is sponsoring this giveaway and has offered to give two lucky winners prizes worth Rs.750-Rs.1000 each. Aloe Veda is a Personal Care company with products inspired by Aloe Vera. They bring you the goodness of Aloe Vera, Healing Natural Herbs and Essential Oils blended with natural and man-made cosmetic bases in a functional form for daily use products. I would like to thank them for this collaborated giveaway. This giveaway is valid only for Indian residents. However, those who have relatives/friends in India can win one for them too if they have valid Indian address. The giveaway starts on 23rd Sep,2012 and ends on 24th Oct,2012. To enter the giveaway you have to follow certain rules and leave a comment with details. There are some mandatory conditions which you need to fulfill to get qualified for the giveaway and some optional entries to increase the probability of your chance of winning. 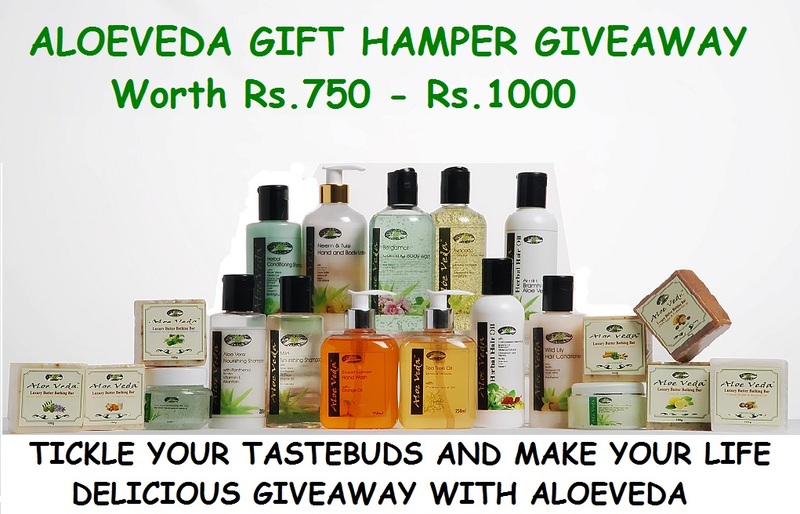 1) Click here and follow 'Aloe Veda' page on facebook. 2) Like our page on facebook. --> Your favourite product and what you like about Aloe Veda. If you want to increase your chances to win, try fulfilling additional entries given below. Once done, leave the comment in a below format. Mention the number and details as below only for whichever entry you completed. Please do not spam with wrong entries. Please read the post carefully and follow the format to avoid confusion. Any un-following of blog after the giveaway ends will ban the person from future giveaways. All the very best to each one of you! You now have 5 entries. Do the blog post ASAP and let me know Jillu. Good luck! A- Right now i am using Aloeveda coconut oil and castor oil...these two are my favourite,as combination of both reduced my hair fall to some extent. what do you like about Aloe Veda? i like the simple packaging,the company's claims as it bring my smile back after using there product ! You now have 10 entries altogether Samannita. All the best! Like about Aloe veda: Aloe vera is a natural healer, so it is indispensible for the well being of man. since aloe veda deals with the curer products i like them. Hi Gathampari. You are now qualified for the giveaway with 5 entries. I am not considering the blog post entry as you have directed a wrong link on click of Aloeveda. Please correct and get back. so u mean to remove the link to aloeveda r wat. im sorry since i cant get u properly, could u help me in this regard by being more clearer. Hi Gathampari. What you mentioned is not a link of aloeveda. It is the link of some other website. Please mention only this blog link to get qualified. Mentioning any other link is not correct :) Below is the link. Hai lavanya...i have corrected it.thanks a lot dear. i have removed the aloe veda link. is it k now. Good that you removed it as it was wrong link of some other website which is not aloeveda. U now have 10 entries Gathampari. Good luck! i love aloe veda because it contains natural ingredients which are safe and herbal...it does no harm to the skin..its chemical free.its gentle too not at all harsh..it doesnt break me out or cause allergies. You have 10 entries now. All the best! Hey Snigdha! You are now qualified for the giveaway with 10 entries altogether. What do like about Aloe Veda : I like Aloe veda coz it is made from natural fruits and vegetable extracts. And mainly it has no harmful preservative and beautifully hand made and hand packed. Hey Priya! You are now qualified for the giveaway with 10 entries. All the best! I completed all the entries ...if anything left plz do let me know !!! Aloe Veda product : I love Lavender and tea tree face wash .. The products don't contain harmful chemicals and can be used by everyone in the family. Thank you so much for your wishes !!! I have liked both page. I have liked both(facebook &aloeveda) pages. The product i like of them is their handmade soap as its pure,no harsh chemicals. Hey Keirti! Welcome to my blog. You are now qualified with 2 entries. Good luck dear! Favourite Product : Indian Khus Herbal Body wash.i love the smell of this product. My thought about Aloeveda : I like the blend of natural herbs in each of their product.And its so pure and chemicals free and totally a gift to us.I belive it nourishes the body after every use. Hello! You are now qualified for the giveaway with 10 entries. Good luck to you! Hi Honey! Welcome to Tickle Your Tastebuds And Make Your Life delicious. i like chocolate shower gel, handwash, oils and nourishing cream because my skin is dry.. they are really organic products. Its not about commenting in aloeveda but I was talking about commenting here. Already a part of both the FB pages. Well i have been using Aloe veda products for a while now and i am currently using Citrus Mint Luxury Shower Gel, Herbal Conditioning Shampoo and Wild Lily Hair Conditioner religiously. All these are my personal favorites and i end up recommending these to all the herbal products freaks like me. The shower gel has made my skin velvet smooth and clear. The shampoo and conditioner have really helped in reducing the hairfall and made my hair stronger then before. I like the fact that this brand uses only the purest good-enough-to-eat ingredients making it the ideal nourishment for skin and hair! i guess i missed out on that..i have re arranged it now. i like their range which starting from soaps to oils which are neatly packed with a pleasant smell. My favourite product is Moisturising Bathing Bar - Sandalwood. I love this product as the therapeutic blend of Sandal Wood and Cedarwood Oils combined with skin protecting Aloe Vera & moisturising natural Glycerine is very good for the skin and is very refreshing, induces calmness and positive thoughts. I also love the awesome smell of Sandalwood and Cedarwood. I love Aloe Veda because it has a huge collection of outstanding products that blend together the goodness of the wonder plant Aloe Vera, the secrets of the ancient science of Ayurveda, Healing Natural Herbs and Essential Oils blended with cosmetic grade natural and man-made carriers in a functional form for daily use products such as Bathing Bars, Shampoos, Hair Conditioners, Hand Washes, Face Washes, Body Washes, Moisturizing Creams, Aloe Vera Skin Gels, Hair Oils, Body Butters, Sunscreens and Hand & Body Lotions. Each product is highly functional and a combination of art, nature and technology brought together to give us an unique and next generation wellness experience. There is no adverse effect of these products on the skin and body unlike the products having chemical ingredients. my favourite product is Nourishing Aloe Vera Gel because it keeps my skin nourished all day long. i like Aloe Veda because all its products are ayurvedic. it has no side effects. Hey Ashma! Welcome to the blog. I love Aloe Veda because its an ayurvedic brand. I love its shower gels especially 'Citrus Mint Luxury Shower Gel'. It has such a pleasant fragrance and leaves my skin soft, clean and refreshed. Hey Kavita! Welcome to the blog. I like especialy Chocolate Vanilla Luxury Shower Gel in Aloe veda products becoz there products are made up of natural ingredients so that we can can use it without giving a second thought ..
Hey Swetha! you are now qualified for the giveaway with 1 entry. I could not find ur GFc entry. Hence not considering that. Please check and confirm which page ur entry is in. Hey Aparna...you are now qualified for the giveaway with 2 entries. Good luck! I love Aloe Veda Strawberry Luxury Shower Gel because of it's lovely fragrance. It soothes my skin and is very mild unlike other soaps ! And it's soft effect lasts whole day long ! And most importantly it's chemical free and natural ! I love it and would considered it as best product with my own personal experience ! Hi Apoorva. Ur now qualified for the giveaway with 1 entry. I couldnot find ur name in GFc followers hence not considering that entry. Pls check n let me know where it is. I like Aloe Veda Strawberry Luxury Shower Gel because of it's love ly fragrance. It is very mild and gentle gel unlike other soaps and soothens my skin.It has a wonderful fragrance which last for whole day long.Most importantly it is made up of natural ingredients and do not contain harmful chemicals and thus is very mild to my sensitive skin.This is the best bathing gel I have ever used as per my personal experience ! I have liked both the pages !! Done both mandatory and additional conditions for the giveaway ! Hi Apoorva. Pls share the blog post and blog link. The one you shared is google+ circles. But u still have 1 entry. Good luck dear! Only 1 entry :O for all this ? Here, I have shared blog is and blog post link ! Now how many entries I have? I have followed you and have suscribed you via email. Hi Apoorva. Previously you fulfilled only 1 entry correctly that is why one entry. Even if you give details and it is incorrect, we will not consider it. Now after I told you that I didnot find your name in gfc followers, you have followed via GFc and also sent ur blog links. So we will consider it now. Now you have 10 entries. But please check your entries next time dear before you send to avoid confusion. Sorry Lavanya !! But finally em done with it !! It was first time I have participated in a giveaway like this so don't know exactly what to do sorry !! Really hope to win ! !